After sampling some delicious cakes for desert at the Scale House Restaurant in Hardwick, VT, I was excited to include that restaurant’s feature. 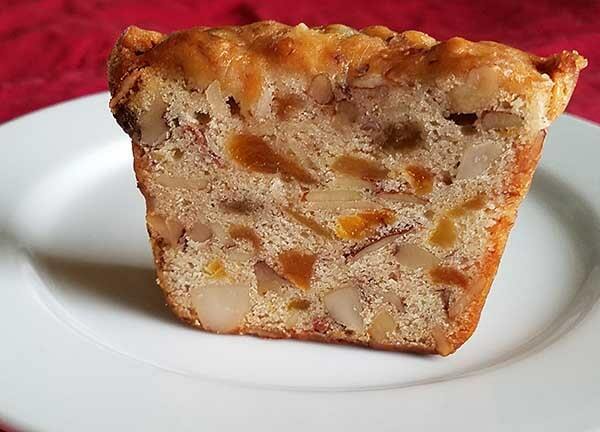 I later learned that these cakes came from a local bakery – Bien Fait, in Greensboro, VT.
Now, I was familiar with the bakery as they have been an online fruitcake company for a long time. But on hearing about their new line of restaurant desserts, I had to see what else they were up to. Luckily, I was able to schedule a tour of their bakery, and there’s a whole lot more than fruit cake going on there. When I arrived, I was greeted by Katie, one of the bakers for Bien Fait. She led me into an old farm house, where I was met with rolls of labels neatly lined up, freezers that took up a whole corner of the room, and an office area. But on the other side of that room, through a doorway flooded with light, the real magic was happening. Through the doorway, two other women were working. One was decorating the top of a chocolate cake while the other was brushing something onto a tray of loaf cakes. Katie led me into the brightly lit kitchen where the smell of bourbon and sugar filled my nose. It was bourbon that was being brushed onto what I now could identify as fruitcakes. The counter had an assortment of small pies, cake slices, and fruitcake samples ready for me to try. I was delighted. I’ll come back to the sampling in a moment – but the sheer variety of offerings took me by surprise. How had I missed this local food producer’s expansion! 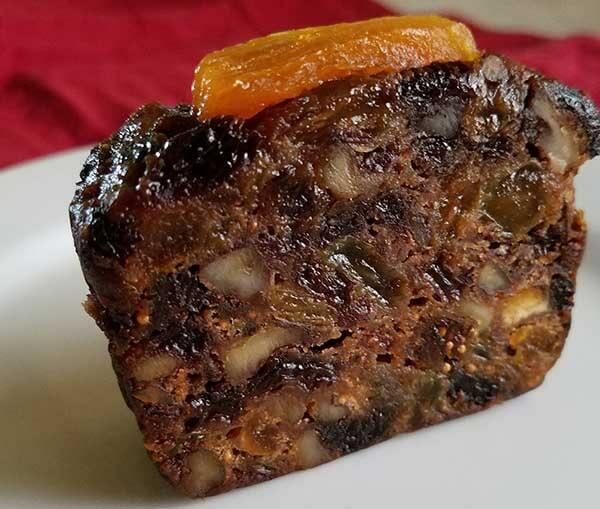 Saying fruit cake conjures up thoughts of the bricks offered up on holiday shelves filled with brightly (artificially) colored dried fruits. Many people are not fans of these holiday staples. But true fruitcake, made the way Bien Fait Cakes does it, are desserts to be admired. 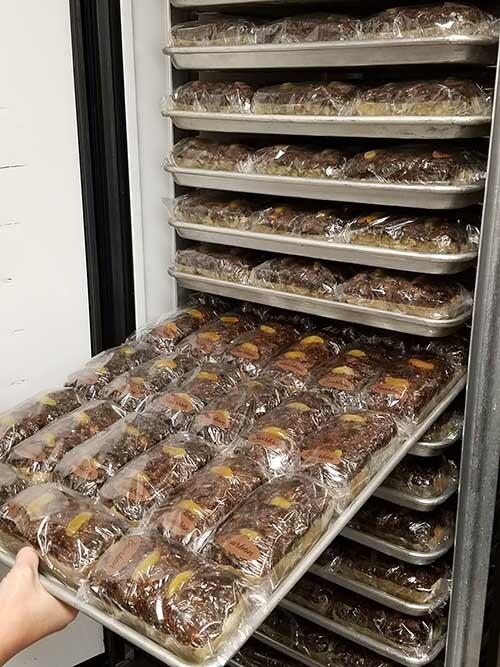 Filled with fresh dried fruits, with no preservatives or artificial colors, some made with real, local, maple syrup and many preserved with quality alcohol, each version of fruitcake has a flavor all its own. They currently offer 6 different varieties. Then there are the tea cakes. Sweet and fruit filled, these cakes have more of a dense bread texture – perfect for coffee or tea pairing (who knew). There are 5 varieties of these cakes, followed by another 4 Biencakes. Biencakes are also loaf cakes with a texture somewhere between a fruitcake and a teacake, and delicious enough to deserve their own category. I was also able to see, and taste, their pumpkin cheese cake – something being worked on for restaurant desert menus. 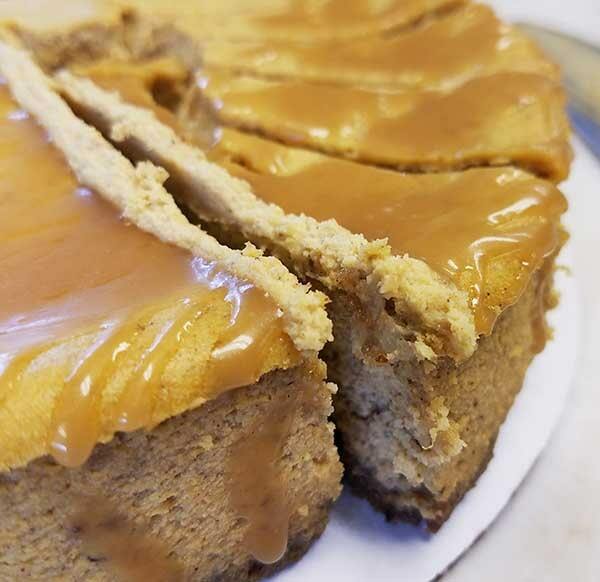 Take the flavor of pumpkin pie, intensify it, and add in the creamy texture of cheese cake with a graham crust and you have one of the best fall flavored deserts I have ever experienced. Oh, and there was a hint of bourbon in there as well – truly delicious. I took 2 boxes of cake samples home with me to try over coffee with my husband. These sample boxes are available for sale through Bien Fait’s website. We were able to try a slice of most of the bakery’s loaf cakes. And though I was impressed with all of them, we did pick out a few favorites. Now, these cakes are not sugary sweet like yellow cake – they have a subtle sweetness brought on by dried fruits, maple, and liquors. The texture is slightly crumbly yet sticky instead of being a fluffy sponge like other cakes. But each bite is packed with flavor, and that flavor changes as different dried fruits and nuts are chewed. The traditional Bourbon fruitcake was our favorite fruit cake. Filled with the caramel flavors from brown sugar and Kentucky bourbon offset by apricots, golden raisins, figs, walnuts and pecans, this cake is a delight of textures and flavors without being overpowering. The lemon-berry tea cake won out for its category. Light and sweet, it tastes like sunshine – a burst of fresh flavors on your tongue. This was followed closely by the maple pecan teacake, with a a subtle sweetness finished by a pleasant maple flavor. The price tag on each cake seems may seem a bit high at first glance – about $18. But, these are hearty cakes. You will not be finishing them off in a sitting. Consisting of fruits and nuts, a slice will have you feeling full. We sampled 12 cakes with coffee one morning – having a bite or two from each, and I was. unable to eat any more. The sample boxes lasted us a few weeks. 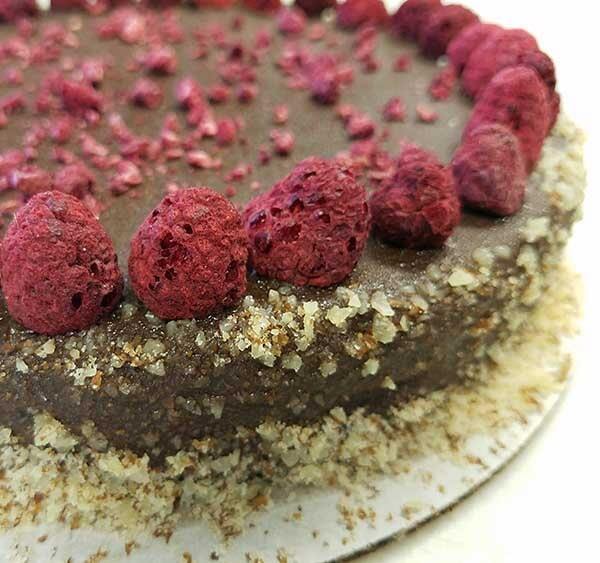 These cakes are also made with all natural, high quality ingredients. 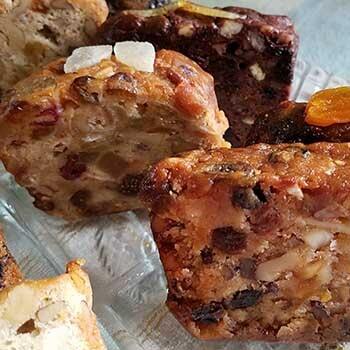 If you have not liked fruitcake in the past, I suggest ordering a sampler – I think these cakes will change your mind. In addition to the pumpkin cheese cake, I have tried a few of the other desserts Bien Fait offers. The lemon cheese cake with lemon curd and the flourless chocolate cake were the two we tried at the Scale House (you can read about them here). 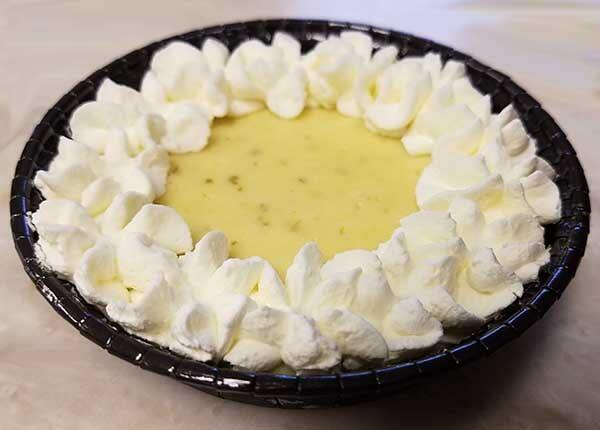 While visiting the bakery, I sampled the classic lime tart, something like a key lime pie with strong citrus flavor that shocks your taste buds, and the carrot cake, filled with shredded carrot and spice flavors that blend together with the sweet, creamy frosting. In addition to all of the deliciousness I mentioned above, they also makes pies – for sale locally at Willey’s Store in Greensboro, regular cakes for weddings and celebrations, fruit bars, granola, and tarts. Sales are made through their website, or by contacting the bakery for special orders. They also have a number of samplers and gift baskets for sale – perfect for the upcoming holiday season. You can bet some of these cakes will be finding their way into my holiday diet!